This simple casserole recipe has layers of creamy potatoes (think Potatoes Au Gratin or Scalloped Potatoes) topped with chicken, smothered with cheese and bacon! I think I’m going to start awarding recipes a “God Bless America” title when they’re really really amazing. Remember when I made the Cajun Cake and it was so good all I could say was God bless America, that’s good so that’s what I ended up renaming the cake? Well, when I ate this smothered chicken today I had the same experience. The kids loved it. Husband loved it. And I loved it. I mean like loved it loved it. There was not one bit of this left when we were done with it. The kids were using their bread to sop up the cheesy bits of potatoes from the bottom of the dish when we were done. I didn't even have to rinse the casserole before I put it in the dishwasher. The bottom layer is like potatoes au gratin then it’s topped with tender, flavorful chicken and bacon and it’s all smothered in cheese. I mean, come on! Talk about a home run for your taste buds! And the best part? It’s all wrapped up in a perfect casserole. Before I tell you about the recipe, let me tell you how it is that I came to cook it. My pal, Stacey Little from Southern Bite, just published a cookbook! And I have the honor of reviewing it and hosting a giveaway (details below)! The way this usually works is that I read through the cookbook, pick out a recipe to cook, make it, tell y’all about it and then host a giveaway. As I was leafing through the book (which is chocked FULL of amazing, easy Southern recipes) I came across Stacey’s Easy Smothered Chicken and just knew I had to make it! I bought all the stuff I needed to make it and then had an idea. Stacey’s recipe doesn't have potatoes but I got to thinking that all that creamy goodness could easily work with sliced potatoes to make a casserole. And I’m one of those folks who, if I've got to turn my oven on, I’m getting as much out of it as possible! Deciding to use potatoes and make a casserole caused me to make a few other changes as well so what I ended up with isn't exactly like Stacey’s recipe. But they’re definitely close. Like cousins. Like first cousins. Who are buddies. Combine cheese soup and milk then whisk until smooth. Reserve 1 cup of cheese soup mixture and set aside to use later. Wash and peel potatoes then cut into thin slices (about 1/4 inch thick). Spray the bottom and sides of a 3-quart 13x9 baking dish with cooking spray. Spoon 1/4 of the cheese soup mixture into the bottom of the dish. Add a single layer of potato slices. Season potatoes with salt and pepper. Spoon another 1/4 of soup mixture over potatoes. Repeat this process two more times so that you have three layers of potatoes topped with soup mixture. Cover dish tightly with aluminum foil then bake at 350 degrees for 30 minutes. Meanwhile, slice bacon into 1/2-inch strips and cook in a large skillet over medium-high heat until bacon is browned and crispy. Remove bacon pieces from skillet with a slotted spoon; set aside. Season chicken tenderloins with salt and pepper then sauté in bacon drippings over medium-high heat until lightly browned (we’re not trying to cook them through, just get a nice sear on each side); set aside. Remove dish from oven and uncover. 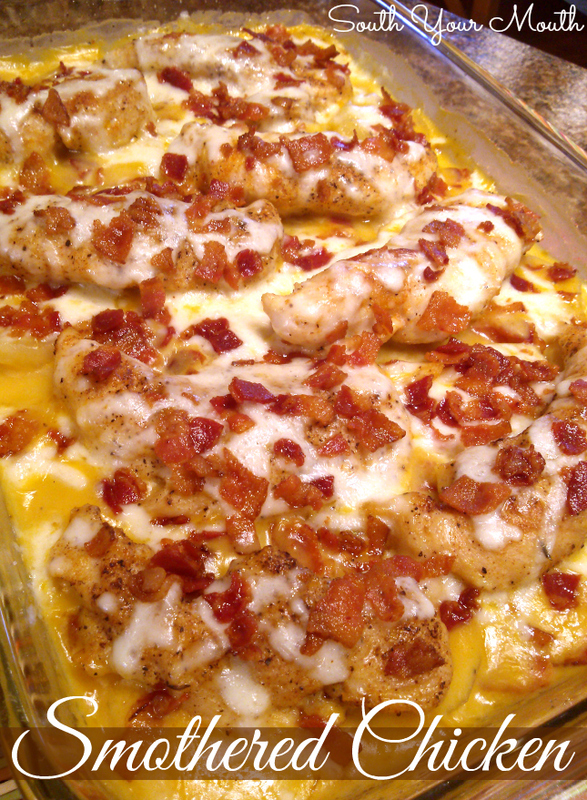 Arrange chicken tenderloins on top of potatoes and pour reserved cheese soup mixture over chicken. Cover tightly again and continue cooking for 30 more minutes. Remove dish from oven and uncover. Sprinkle shredded cheese evenly over chicken and potatoes then top with bacon pieces. Return dish to oven and continue cooking, uncovered, for 5 minutes or until cheese is melted and bubbly. Though I have made this many many times and never had this issue (and though an hour is plenty time for three layers of thinly sliced potatoes to cook) a few folks have reported having to cook their casserole longer for the potatoes to get done. Be sure your potatoes are only 1/4" thick and that you only have three layers. If potatoes are not par-cooked and somewhat tender after the first 30-minute cook time, cover again and cook for an additional 15-20 minutes before adding the chicken. As of 2015 Campbell's Condensed Cheddar Cheese Soup is totally different in Canada than it is in the US. I used it last week on vacation and was shocked at the difference. The colour (you like I spelled it like you do, right? ), texture and flavour (and again) are different but it should still work. I just can't promise it will be as delicious. Boo. Yo, Campbell's, what's up with that?? I used Monterrey Jack because I thought the white cheese would be a nice contrast to the cheddar soup mixture but feel free to use whatever's handy! Don't forget to salt and pepper each layer of potatoes! 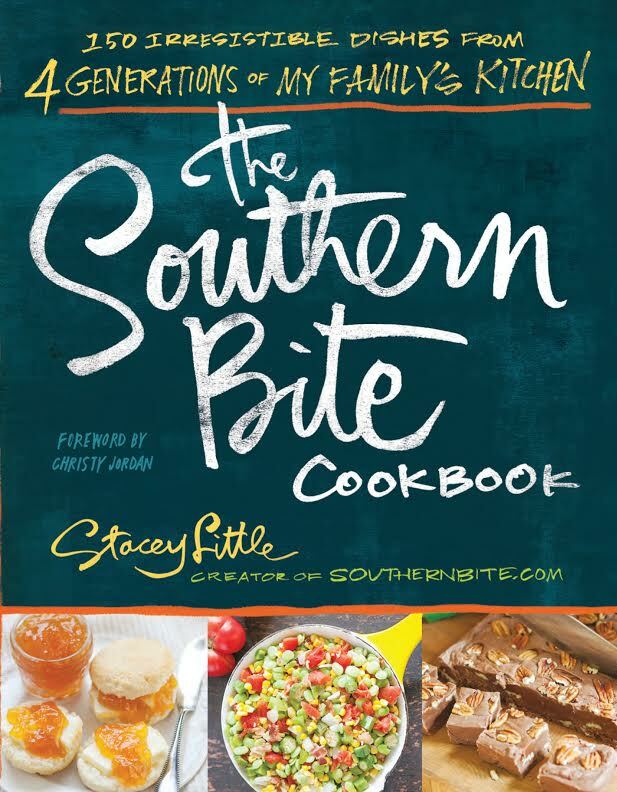 To win a copy of Stacey Little’s, The Southern Bite Cookbook, simply leave a comment below with your email address (just one comment per email address, please). If you’re not comfy doing that, you’re more than welcome to send me an email at southyourmouth@aol.com with “The Southern Bite Cookbook” as the subject and you’ll be entered. I will randomly select and email the winner after 4PM EST on Monday, March 31, 2014. Giveaway starts today Monday, March 24, 2014 and ends Friday, Monday, March 31, 2014. Contest is open to US residents only. This looks like a great book and I would love to win it, thanks for the opportunity. This is definitely on my list to make, as it has all of the hubby's favorites in it....cheese, potatoes, chicken and BACON! Looks AMAZING!!! I am so changing the menu for this week! If the recipes are anything like yours I'd love a copy. 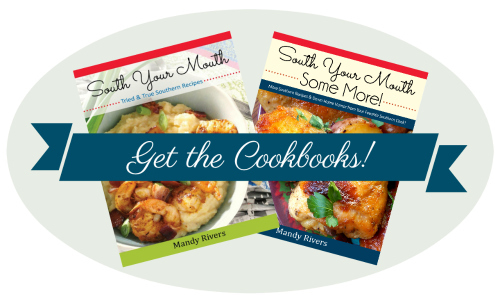 Mandy, I use your recipes all the time and would love to have a copy of the Southern Bite Cookbook. The potatoes, chicken and cheese looks like it will be great. I will try it and let you know. I have to try your version of Smothered Chicken! Looks and sounds yummy! Perfect-got a bunch of cheddar cheese soup on sale and have been looking for the perfect recipe. I think this is it as my honey is Mr. Potato! Would love to try this cookbook! I LOVE, LOVE, LOVE your web site. If this book is even close to YOUR recipes, I'd love to add it to my collection. I love all the reciepes i have found on your site and your friends. All things Southern????? All things GOOD!!!!!! These recipes are wonderful! Would love to see your friend's cookbooktoo. The Smothered Chicken recipe looks and sounds amazing. Definitely added to my Try soon List! Made your pimento cheese recipe yesterday for a family gathering and it was the hit of the event! Plan to try the Smothered Chicken next, and would love to win a copy of your friends new cookbook. Sounds delicious! Would love the cookbook! The recipe looks so yummy.....but unfortunately I can't eat potatoes, I know I know it's awful. I looked at Stacy's version and will try that one. I would LOVE to win her book and see what other recipes she has. Love your site and Stacey is a favorite too. Thanks to both of you for providing some good down home cooking. This recipe looks and sounds amazing! Thank you for sharing, and thank you too for the awesome giveaway opportunity! Chicken, potatoes, cheese and BACON.. How could that be anything but delicious? You always have such good recipes. I have saved many of them. I love trying your recipes! Being from New England , I love all your recipes. Hooked my daughter up on your page as she just moved to South Carolina! This looks so yummy! I've pinned it & gonna try it soon!! Thanks for all your recipes posted! Putting this into my dinner menu for next week. Husband and sons will love it!! Absolutely love all of your recipes! My mouth is watering looking at this recipe, would love to see more!! Love your recipes and hope to win! Looks like an AMAZING recipe! I hope I win the cookbook! You are MY kind of cook! I recently discovered you...oh my! Hubby will be happppppy with the luciousness I am about to give him! I would LOVE your cookbook! I have to have a cookbook or recipe card in front of me. The iPad just doesn't cut it! I enjoy your food blog as well as Stacey's. I love all of the recipes and would love to win his cookbook. Thanks. Making this tonight! CANNOT WAIT! Love your blog!!! I look forward to all the yummy food and fun stories you share!!! thank you! this looks delicious and the book looks fun too. I love all the recipes you post and this cookbook in my kitchen would be a real treasure. Love your blog, recipes, and stories. My family loves every dish I create from your website. Love this site and would be honored to add this cookbook to my collection! I made this recipe last night! It was delicious and even better today! The husband said it was definitely a keeper! Thanks for all the laughs and the amazing recipes! ncfwater@comcast.net I would love this cookbook! I love Stacey's recipes! Got my fingers crossed that I win his book. I would love to win this book...and I can't wait to try this recipe! I stumbled upon your blog and I am so happy to have found you. I love to cook, and I have been stalking your page everyday since I found it. :) Stalk in a good way!!! Once seeing this recipe I had to check out Stacey's...make that 2 new webpages to stalk for new recipes! Pick me...oh please pick me!!! I'm new to cooking and my family thinks I need all the help I can get. I will try this recipe next. I am excited to try this recipe, I think with green onions! I would LOVE to have the Southern Bite Cookbook. I'm a Southern GURL by way of GRANNY! And this Chicken is about to go down at my house!! love love love cookbooks!! My husband always complains when I buy a new one...till I make a yummy recipe out of it!! 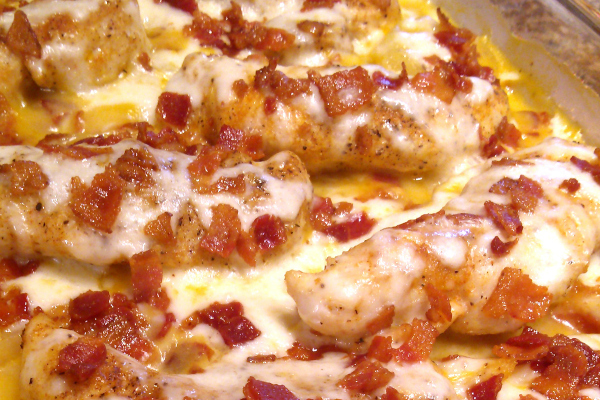 We're making this smothered chicken and cheesy potatoes tonight for supper!! If the recipe you posted was any indication of the yumminess of the other recipes, I'm in for sure! This sounds like a great dish! Defiantly gonna have to make. All your recipes sounds great. Thank you. Would love to win this so I can learn to cook new things for my son and fiance. What a cool gift to win!!! Your recipes look so delicious. I'd love to win. Adding cheese soup to the grocery list (but may try a cheese sauce instead). I love all of your recipes, please pick me!!! Shrimp and Grits. Very Southern. Enjoy! THIS LOOKS LIKE A DISH BOTH MY KIDS AND GRANDKIDS WILL LOVE. I AM GOING TO TRY IT TONIGHT. THANKS FOR THE GREAT RECIPE! This looks amazing! I am so trying this tonight!! Excited!!!! Anything backed by you - must be good!! I am such a huge fan, not one of your recipes have let me down yet!! [crossing fingers] I'm at marciewho at email.com! Thanks for opportunity to win the Southern Bite cookbook. Love your website. Would love to try these recipes!!!! I need this cook book more than you know. Lol. SonyaShops@Yahoo.com. Thank you so much for putting all of these great recipes in one place! I love your blog and wish you much success in your new endeavors! I can not wait to make most of what is on this blog! I'm hungry just looking at it all. Thank you so much for all the great ideas!!! Can't wait to try this!! With three kids I'm always looking for something that will make everyone happy, this sounds like it would!! Cooking has alway's been a thing I've loved doing FOREVER! Looking for YUMMY recipe's is another, so i'm so happy I ran across your web site. I LOVE it, you really got it going on! I just read the recipe for The Smothered Chicken and can't wait to try it. I'm praying right now i'll be a winner of your friend's cookbook since I collect them and this one sound's EXCELLENT! Thank's for being here for all of us, I really enjoy you!!!! The Smothered Chicken recipe looks so delicious and am anxious to try it. I came across this from Ziplist as it was a recipe of the day type of thing. Anyway, am always looking for new ways to fix chicken. Would love to win the cookbook as well because anything Southern has to be good! Hope I win, love your recipes and making this for dinner tonight. Can't wait, yummy! This looks goooood!! I'd love to have the cookbook! OMG!!!!!!!!!!!!! This was so good and i added green onions and jalapenos and omg!! Thank you so much for this recipe!!!!! I will be trying this recipe this week! This cookbook looks awesome. Would love to win it! In the South we call cousins who are that close Kissin' Cousins. Can't wait to try out both versions of this! Congrats Mandy! This luscious recipe had the most clicks at last week's Weekend Potluck! Thanks so much for your faithfulness to be a part. We love that you share at our virtual table. Thinking of trying some french fried onions on top.. I just found your website yesterday and Smothered Chicken is the 3rd recipe I've tried all ready. My only complaint is there were no leftovers! Love your site and your writing keeps me in stitches. I can't wait to try some of the other recipes. Do you think i would work to use hash brown potatoes instead of cutting them all up? This is amazing! Thank you so much. I am so hoping to have the cookbook. This is awesome. I will try to make it tonight at my home. Tiana, I'm so sorry I didn't see your comment before now. Thank you so much! Hi I am new to your blog and just read over the recipe and I can't wait to try it but I think I am going to leave out the onions and in some wonderful sautéed mushrooms that was cooked in that bacon well sounds yummy and I can't wait to try more of your recipes keep your blogs coming. Hello Mandy, I looked through the comments and didn't see answer to my question so I'm going to ask anyways just in case I missed it. Is there something other than Campbell's Cheese Soup I can use, as me and my family do not like it? This recipe sounds amazing other wise. My family and I don't care for the flavor of the cheese soup. Is there something else we could use? I'm not sure as I've never frozen it myself but I can't imagine that you couldn't. If you do, let us know how it turns out! Made this today for dinner. Very good but the potatoes took forever to cook. Baked it for 1 1/2 hours total and they were still slightly under done. Next time I will parboil the potato slices before assembling the casserole. I made this last night for my family and it was a HUGE success! I used a Rotisserie Chicken seasoning on the chicken when I was searing it which made it absolutely to die for. I also added the bacon and the cheese when I added the chicken (missed that I was supposed to wait) and baked it for 45 minutes after the chicken was added and it still turned out fabulous. The chicken was so moist. Great recipe! My family thanks you. Thanks! I love collecting great cookbooks! Ok - silly question: is it supposed to 1 & 1/4 cup of milk, or just 1/4 cup? I collect cook books and I am sure this would go great with my collection. My email address is maloneymona@yahoo.com. Thank you and I be waiting to hear from you.